It’s our one-year YouTube anniversary! 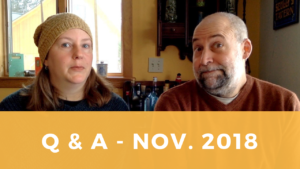 To celebrate we asked for your questions and in this episode, we answer them. Vermont Brewers Association – More than 50 breweries in the state, with a map and links to more information, so you can plan your own trip. Brocklebank Craft Brewing – Tunbridge nano-brewery run by our friends Ben and Anne Linehan. Seasonal styles that range way outside the standard New-England IPA. First Branch Coffee – A cafe in the village of South Royalton, run by our friends Andy and Chris of Upper Pass. With the opening of the cafe and tasting room, you can now get Upper Pass beers there as well. Perfect for the hop-loving IPA drinker! Good Measure Brewing Company and Carrier Roasting Company – Neighboring ventures from our friend Scott Kerner, also part owner of the Three Penny Taproom in Montpelier. Visit the brewery’s tasting room and coffee roasting company for a fun afternoon out in Northfield, Vermont. Then head next door to the Cornerstone Burger Company for a casual dinner and extensive tap menu, featuring other Vermont beers. Vermont Pub & Brewery – The original Vermont brewpub, co-founded by Greg Noonan, the beer advocate behind important changes to Vermont’s brewery and home-brew laws. This large establishment by the Burlington waterfront is a great place to grab a drink or enjoy some pub grub with friends. Farmhouse Tap & Grill – A farm-to-plate dining experience with an extensive local beer menu. While they don’t brew their own beer, they have a great selection of local taps and a welcoming beer garden in the summer. River Roost Brewery – If you’re traveling further south, White River Junction is a fun, post-industrial town to wander around and window shop. While you’re there, taste River Roost IPAs and and other seasonal styles and pick up a growler to go. Head to Big Fatty’s BBQ next door and “put some south in your mouth” while quaffing from their extensive selection of taps and bottles. And if you’re in the mood for a show, Northern Stage offers a range of classic seasonal performances and children’s shows intermixed with avant-garde and new works. Lawson’s Finest Liquids – Our personal #1 pick for the Vermont IPA style, Lawson’s Sip of Sunshine is a staple in our home beer pantry. We’re looking forward to our first visit to their expanded tasting room and retail store in Waitsfield, Vermont. Vermont Sheep & Goat Association – While the association’s mission is primarily to support shepherds and goatherds, the website also lists Vermont farms by the products that they make. You can find breed-specific yarn, fleeces, rovings, and other locally made goods. Green Mountain Spinnery in Putney, Vermont, mills fibers for US producers as well as their own lines of New England and USA sourced wool yarns. Wing and a Prayer Farm in Shaftsbury, Vermont, hosts workshops and retreats, and Tammy sells yarn and rovings from her mixed flock of fiber animals.